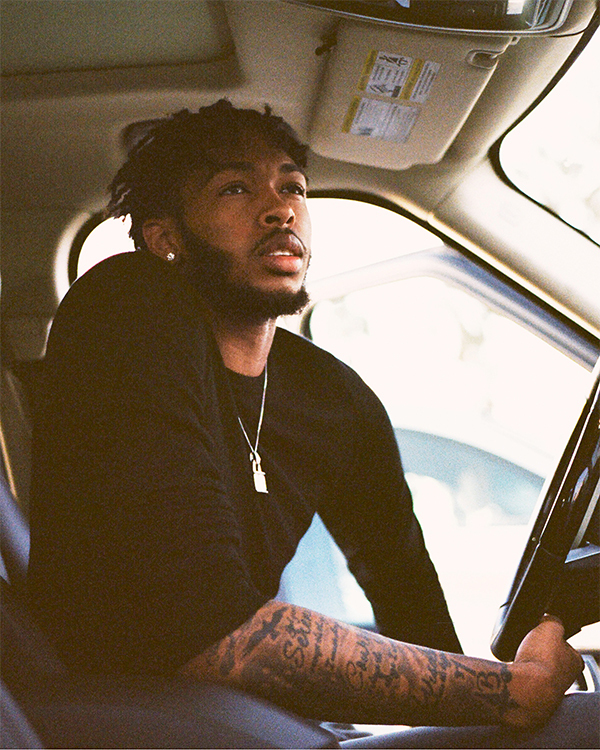 Second-year forward Brandon Ingram might be 6’9” and under 200 pounds, but the 20-year-old doesn’t let his tall, thin physique stop him from embracing every Angeleno guy’s favorite wardrobe staple: ultra-skinny jeans. For our part, we’re fully on board with the move. 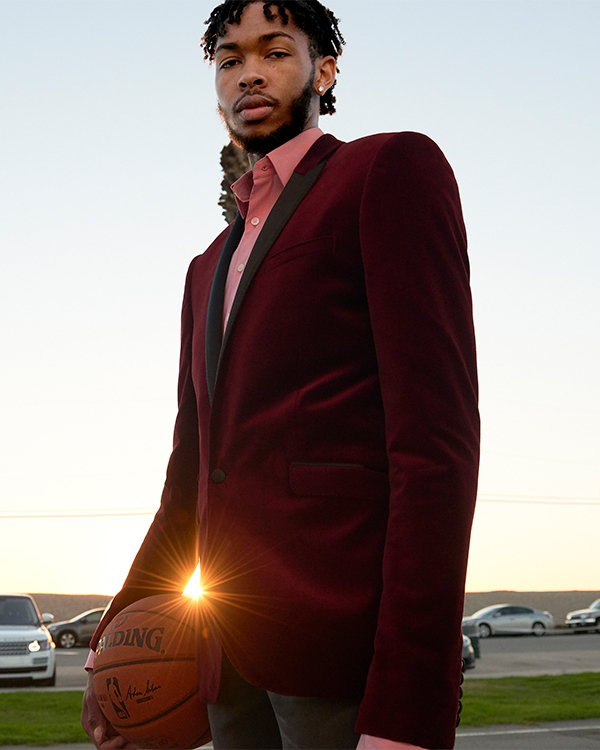 If Ingram wasn’t in the NBA, he could definitely be a menswear model. 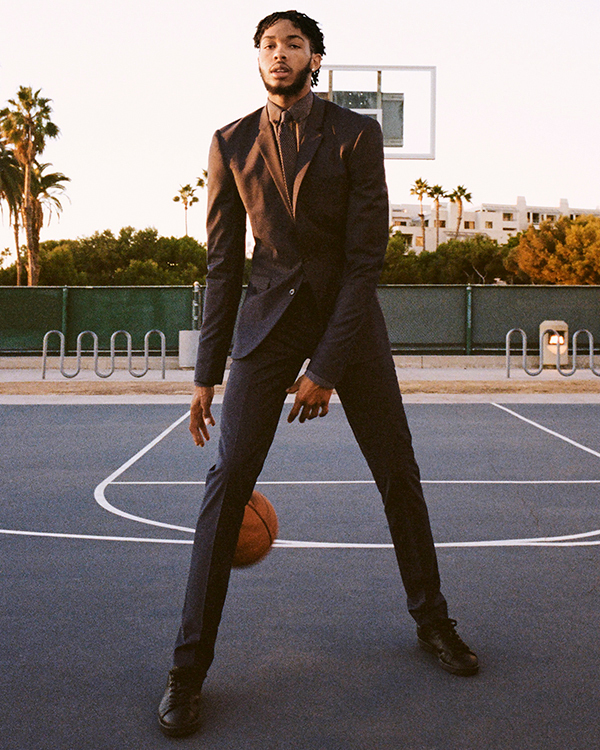 When we styled him for our NBA Game Changers shoot, every suit hung on him beautifully—albeit after a little tailoring through the legs—and our jeans didn’t look too shabby on him either. In short, being Brandon Ingram sounds like a lot of fun. Get to know this athletic talent and style legend on the make through our Q&A below. If you’re a tall guy, listen up. 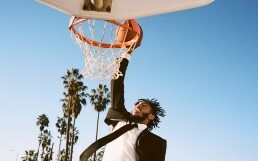 Ingram’s got some slam-dunk styling ideas for you. 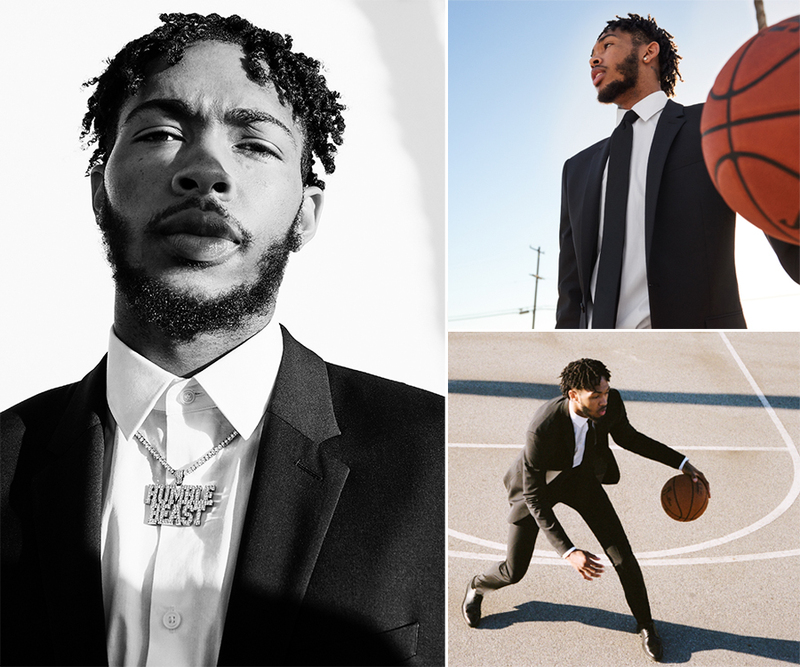 Brandon Ingram: I like slim jeans, solid shirts, and suede jackets. Everything I wear is really slim. What do you tend to wear before a game? I dress up a little bit. Not a suit, but something that looks nice and feels good. What Express look or piece did you like best from your NBA Game Changers shoot? I really like the style of suits that I got to wear because they’re cut slim. The white shirt and black solid suit was one of my favorites. Or in my regular life I’d wear navy or gray. The velvet blazer I wore was cool, but maybe a little bit outside of my normal style. When and how do you wear suits in your regular life? I’ll wear a suit for a special event or a wedding or just those moments when I feel like I need to dress up or just show another side to my style. In terms of shoes, I look at how the suit fits to determine what I’m wearing. If the pants are shorter and my ankles are showing, I’ll wear sneakers. If the pants are long enough, I’ll go with dress shoes. Do you have style advice for any other exceptionally tall guys out there? It can be hard. Most of my clothes I have to get tailored. The Express suits I wore in my shoot fit me well off the rack but I think some tailoring did go into the legs. My body is shaped a little differently than most guys since I have such long arms and legs so it usually requires a little extra work. But other than getting your clothes tailored I would say just dress how you feel. Be confident and you’ll look good. A really thick sweater and my favorite kind of jeans, which are just some black slim-fit jeans. And then maybe some kind of low-top designer shoe or Adidas sneaker. I like jewelry so I’ll probably add a necklace or a watch or something. I have a really bad shopping habit. What’s your trick for pulling off something loud and flashy in a modern way? I think you just have to be confident. And if you feel like you are doing too much, you probably are doing too much. And if you still aren’t sure, get a second opinion. I like Russell Westbrook’s style. He dresses however he likes. He does whatever he wants to do. He doesn’t try to be everyone else.